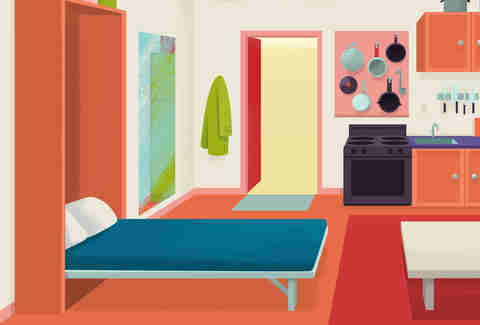 To find out everything from where to store extra folding chairs and guest bedding, to solutions for all your floor-free lighting concerns, we spoke with experts in the industry for tips on how to get your small apartment from cluttered to (semi-)spacious. The entryway to your apartment, if there’s even space that could be deemed an “entryway,” is probably very small, so adding a bench, side table, or coat rack is likely to make it so you can’t even walk in the door. Still, there are plenty of ways to keep the front part of your apartment organized without causing a fire hazard. Professional organizer and founder of Unstuff University, Andrew Mellen, who lived in a 325sqft apartment in Manhattan for 12 years, says to “use your walls whenever possible.” Having a hook on the wall right inside the doorway for your keys and frequently worn jackets is an ideal space saver. Hooks are also essential for kitchen storage. 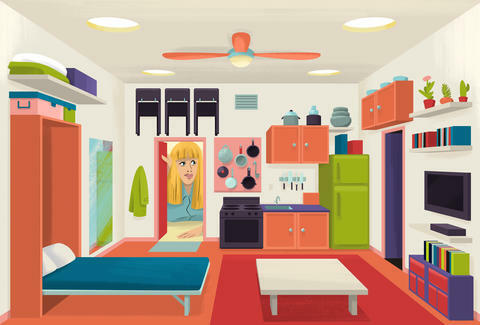 Mellen suggests hanging bulky pots and pans on the wall closest to the stove, or hanging a pot rack from the ceiling. Adjustable chains make this an accessible option for both high and low ceilings. Because cabinet space is slim to none in an NYC apartment, “be smart about the utensils that you’re keeping and if you don’t cook a lot, a basic set of utensils will be sufficient,” says Mellen. Replace your potato masher and other individualized kitchen tools with a blender or food processor, which can do the work of most kitchen stuffs. 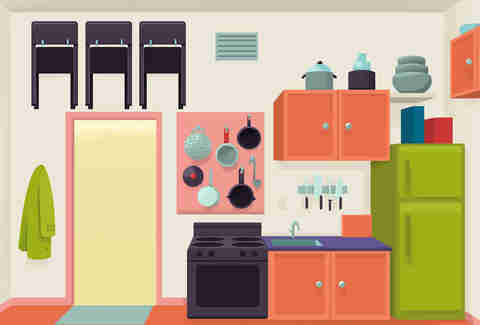 Sharon Lowenheim, owner of NYC’s Organizing Goddess, Inc., suggests small apartment owners or renters “add lazy Susans and stacking shelves to cabinets.” This allows use of all vertical space, rather than just the bottom of the shelf. As for garbage, look into getting a smaller waste bin to keep under the sink instead of having it take up space on the floor. “It will save space and also keep the garbage out of sight -- it's a win, win!” says Petty. When your kitchen and living room are one and the same, dual-purpose furniture is going to be your best friend. Mellen suggests using a coffee table that doubles as a dining room table, like this mini-table from Resource Furniture that can rise up to a regular height for dining or be used as a desk. Sleeper sofas, like these from Mitchell Gold + Bob Williams, allow you to have a proper guest bed without having to sacrifice a comfy couch or your guests’ backs. (Please, no blow-up mattresses.) Hanging folding chairs on the wall instead of stuffing them in a corner or taking up room in a closet is another way to prepare for guests without losing space for your everyday life. If you happen to own your space, or have the approval of your landlord, some minor bathroom alterations can help in a big way. “I would encourage people to swap out a pedestal sink for a sink with a vanity below it to buy yourself some more space,” advises Mellen (IKEA and Home Depot both have inexpensive options). If you’re renting and don’t have the luxury of making those decisions, Lowenheim says adding a skirt to the sink helps to hide anything you want to store behind it. Hanging baskets or buckets of galvanized metal are also a way to keep towels, soap, and other restroom necessities off the surfaces of sinks and backs of toilets. Mellen notes that they can also serve a dual purpose as a vase for flowers. For additional storage and space, Mellen had a Murphy bed custom made and “bought two bases for the captains bed and stacked them, screwed them together.” This gave him four drawers instead of two, which allowed for extra storage for linens, blankets, and bulky sweaters. If you’re lucky enough to have a closet (congratulations! ), installing some shelving inside of there is also an ideal storage solution. “Whether you’re going to The Container Store or Home Depot, it’s easy enough for under $100 to do what you need to do,” Mellen notes. If you’ve got a bunch of stuff you don’t use often, like guest linens or seasonal items, put those on the highest shelf, and add door hangers and a hanging shoe rack for extra jacket and small item storage. Lowenheim recommends the hanging shoe rack for storing shoes, belts, sunglasses, gloves, and other small accessories. For clothes that need to be hung, Mellen suggests the thin, felt Joy Mangano Huggable Hangers for saving space. You can access all those high shelves using an apartment-appropriate ladder, like this Ultraslim Aluminum Step Stool from Williams Sonoma. It folds to be 1¾in thick and can easily be hung on the wall or slid between the oven and refrigerator. If you don’t have a closet, take a stroll around the Garment District and you’ll find many storefronts offering custom rolling racks. Mellen’s custom-made rack (which costs just around $100) serves as a closet on wheels, with shelves on the top and bottom for holding luggage and other clothing-related items. The wheels also make it easy to move around when company comes or when you have to clean or move furniture. In addition to floor-free lighting, Petty believes that clean, simple design makes for a smart and organized small space. “Many people think you can't incorporate color into a small space but you can! Darker paint colors can even make a space feel larger.” You can also use a dark color to help designate separate areas of the same room, like painting one section of the wall to indicate where the "living room" ends and the "bedroom" begins. If your landlord isn’t OK with you painting (or you don’t want to deal with repainting after you move out), you can achieve the same result by using something as simple as an area rug.